Brand New Sealed Pack. Every time you play, forward and rewind an audio tape cassette, it will leave oxide and other residues on the cassette players head. This will cause unwanted noise and lower quality while playing or recording and reduces life of your device. Use this amazing kit to clean and maintain your Cassette player/ recorder. Kit includes: One head cleaner cassette, which both side of it are usable. 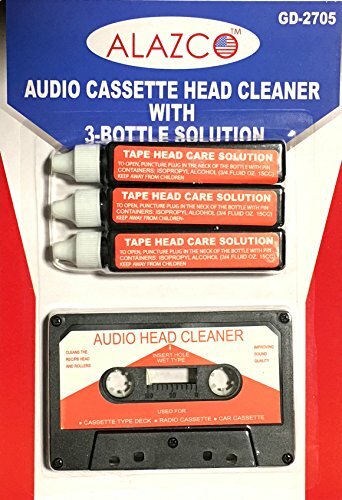 3 head cleaner liquid solutions - Poke the seal on the cap of the solution bottle, and Simply place about 2-3 drops onto the cleaner tape and play it into your cassette player/recorder until it stops. The tape can be used over and over until liquids are finished. Rare - Not available in stores. If you still have your valuable collection of cassette tapes, cassette players at home, car or at school, YOU NEED THIS. Makes a great gift for anyone who has! If you have any questions about this product by ALAZCO, contact us by completing and submitting the form below. If you are looking for a specif part number, please include it with your message.